Little Leaps Press, Inc., 9781948058131, 148pp. There are plenty of leadership how-to books, filled with advice such as "Just do this to get ahead " Lots of books tell you how to become a leader, this book tells you how to stay successful once you've gotten into a leadership role. "How will I use my leadership power?" Co-authored by globally renowned author and executive development trainer Bill Treasurer and retired U.S. Navy SEAL Captain John Havlik, this book unites civilian and military experiences to explore precisely why some good leaders go bad, so you can avoid their mistakes. With decades worth of insight drawn from leading elite military special operations teams, global companies and organizations, The Leadership Killerincludes insightful stories and actionable strategies for becoming, and more importantly, staying, a more effective, confident and humble leader. 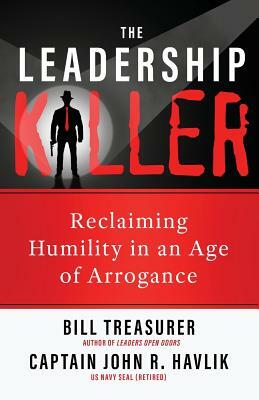 The Leadership Killer: Reclaiming Humility in an Age of Arrogance exposes hubris, the single most lethal leadership flaw. Being a good leader doesn't require being a bad person, and if you know what to look out for, Treasurer and Havlik point out, you can keep your ego and hubris in check and become (and stay) a leader who is effective, successful, and good. With plenty of books written already on how to succeed as a leader, Bill Treasurer and John Havlik offer us something new and greatly needed - practical wisdom on how to survive leadership success. "The Leadership Killer is the literary equivalent of a super tough workout or a day of SEAL training...a book every leader must read." -- Rear Admiral Kerry Metz, USN (Retired), Former SEAL and first Commander of Special Operations Command North.